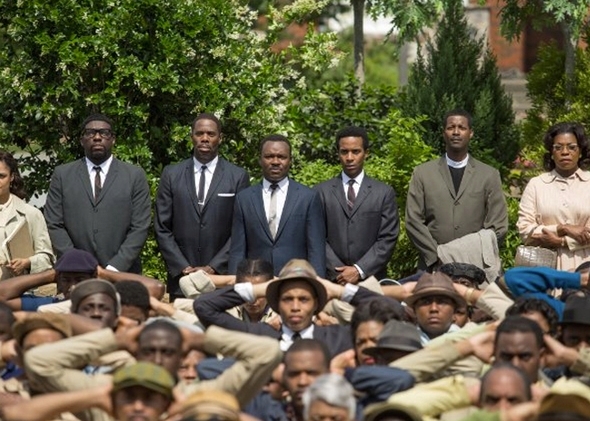 Like two of the other most ballyhooed films from 2014 (Boyhood and Birdman), Selma is a really good film that has been a bit oversold. I suppose if one is going to overrate a film, it might as well be one as noble as this, but in the slightly paraphrased words of my girlfriend, “I just wish they would’ve gotten the facts straight and given this girl a little more gospel.” There’s something curiously missing from Ava DuVernay’s intelligently directed and reverent biopic of our nation’s most celebrated reverend and Civil Rights leader, Martin Luther King Jr., despite many convenient current parallels reminding informed viewers there is still so much work to be done. That missing piece is the call to action. Standing tall in the film are DuVernay’s depiction of the most harrowing events (from the bombing of the four little girls in the church and the violent police suppression of the first attempt to march across the bridge out of Selma towards Montgomery, to the quieter but equally disturbing moments showing the casually institutionalized hate-fueled suppression of the right to vote in court houses across the Deep South) and, naturally, David Oyelowo’s commanding performance as MLK. DuVernay, taking a cue from Spielberg’s Lincoln, does a commendable job showing the slow tension-building behind-the-scenes process of what it takes to organize a meaningful march against injustice and how that can be used as a tool to raise public sentiment for the passing of legislation (in this case, the landmark Voting Rights Act of 1965). The tenants of nonviolent protest are on glorious display here, showing how powerfully effective yet dangerous it can be, as it coaxes the irrational radicals out into the open light of day where those watching on the sidelines are suddenly spurred to stand up because they are left with no other option once violence erupts against the peaceful marchers.